On Monday, January 17th, over 40 youth from the the different parishes in the Cleveland Deanery gathered at St Michael Woodside for a day of fun, food and fellowship. 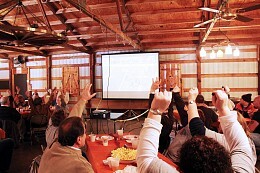 On Saturday, January 22, Archangel Michael Parish held our 3rd Annual Leadership Retreat at Woodside Party Center. 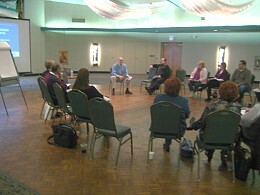 We were grateful to once again have Joe Kormos in attendance to facilitate/lead the discussion. This retreat was a great way for our parish's lay leaders to come together, communicate and share ideas on how we can make Archangel Michael Parish even better. On the feast day of the Meeting of the Lord in the Temple, several brave parishioners made it to the Divine Liturgy, despite the terrible weather conditions. After Liturgy, candles were also blessed. 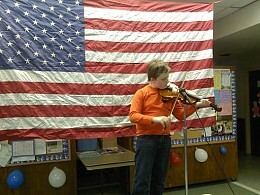 The Junior “R” Club held the 11th Annual Poorman’s Reverse Raffle, and the event was a big success! 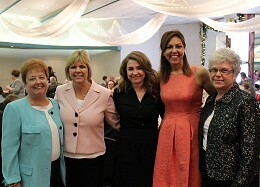 Over 200 parishioners and friends gathered to help support the group! It was a lot of fun and everyone enjoyed the evening! Congratulations to the Big winners of the Grand prize, which totaled $1,500. On Saturday, our Faith in Action group hosted a USO Event Day at St Michaels. Many donations were dropped off, baked goods were sold to cover the shipping costs, and fun was had by all. 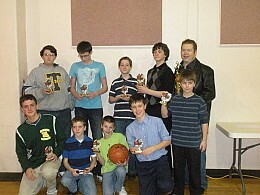 The Cleveland 'R' Club hosted the FOCA District Basketball Tournament at St Michaels Gym. Basketball teams from all over the Greater Cleveland area came and participated. 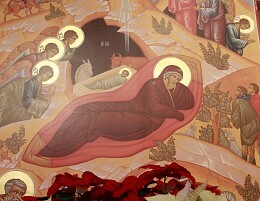 On the Sunday of Orthodoxy, Fr. 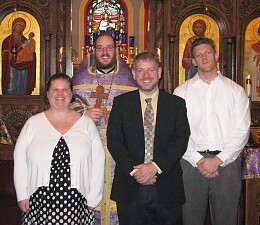 Joseph Chrismated 3 of our catechumens: Matthew, Jason and Amanda. 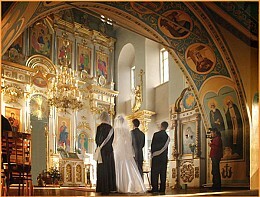 We congratulate them on the day of their reception into Holy Orthodoxy. May God grant them many, many years! 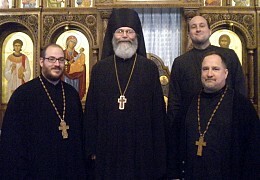 On Saturday March 26th, our Bishop-Elect, Archimandrite Matthias visited our parish. He celebrated the Divine Liturgy and then attended lunch in our church basement. After lunch Fr Matthias spoke about growing up in the Cleveland area, and answered questions from parishioners and guests. 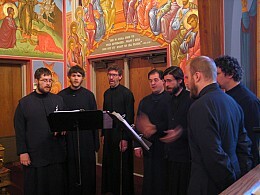 On 4/3/2011 the Dean of St Tikhon's Orthodox Theological Seminary - Fr Alexander Atty - and the student Mission Choir came to our parish. Fr Alexander celebrated the Divine Liturgy and the Mission Choir sang the responses. 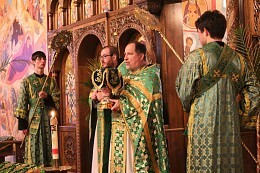 On this Lazarus Saturday, not only did our parish serve the festal Divine Liturgy, but we were also overjoyed at the baptism of Christopher Shaffner. A convert to the Orthodox Faith, Christopher was received into the Church through the holy sacrament of Baptism. 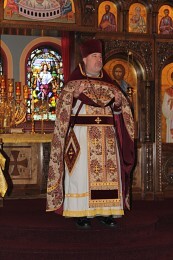 Serving as his Sponsor, was Subdeacon Nicholas Kormos. Following the Baptismal Divine Liturgy, the youth of your church and their parents gathered to offer their time and talents to clean our Holy Temple. They also prepared Pascha baskets to be delivered to our home-bound parishioners. Pictures from our Holy week services. April 29th through May 1 FOCA basketball teams from 9 states converged on our parish, as we hosted this years tournament. The weekend started off with a bang on Friday night as participants traveled to the Quicken Loans Arena (The Q) to watch the Cleveland Gladiators play. On Saturday, 31 teams played on 4 courts from 8am until 4pm. Vespers, the Banquet and Dance followed. Sunday morning began with the Divine Liturgy at our St Michael's, where 5 priests served together. Following brunch, the Championship games were held. What a great, action-packed weekend. After Divine Liturgy, our parish honored all of the mothers of the parish by giving them all blessed flowers. Crosses, hand-painted by the youth of St Michael's, were also given to each mother. For those mothers, grandmothers, and God-mothers that have reposed in the Lord, the parish sang Memory Eternal! Afterwards, a fine banquet was held at our hall, St Michael's Woodside. On Friday night, our Women's Bookclub met for our monthly meeting to discuss To Kill A Mockingbird. After the discussion we watched the movie. We hope to see you next time! On Monday, May 23rd, Michael and Paula Herzak received the 2011 Zamiska Award for their exemplary work and dedication to the mission of International Orthodox Christian Charities (IOCC). This award is presented each year to those who have demonstrated leadership, faith, and selflessness in continuing the good works of IOCC. Congratulations Michael and Paula! Tonight, our parish hosted a Bingo Workers Appreciation Dinner at our Shanty. Our Parishioners who volunteer at our bingo nights were treated to legendary Jim "Toot" Kormos BBQ ribs, coleslaw, potato salad, and chicken wings. 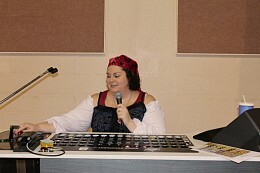 After dinner, door prizes were given out, and the bingo workers even had the rare opportunity to actual play a game or two of bingo! This Sunday, our parish celebrated the feast of Pentecost. We had several volunteers come and decorate the temple with fresh branches and leaves. After the Divine Liturgy, we congratulated Fr. John on the occasion of his 15th year with Archangel Michael Parish - which also coincided with the 22nd anniversary of his ordination to the Priesthood. Many years to Fr. John, Mat. Jani and their whole family!!! 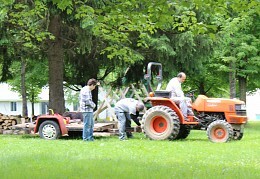 Members of the Cleveland 'R' Club joined forces at St Vladimir's Summer Camp to get the property and facilities in tip-top shape before campers arrive on July 10th. Thank you to all who helped out! On Father's Day, following the Divine Liturgy, all fathers of the parish were wished Many Years. Also, our parish honored all of this years Greaduates - College and high school. 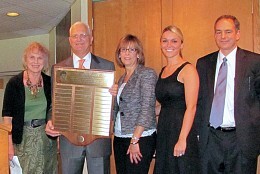 In addition to the graduates, Steve Kovalak was recognized for completing his 10th year as a Sunday School teacher. Following the Dismissal, our parishioners headed down to The Shanty for a picnic of hot dogs and kolbassi. Tonight, members of the Cleveland R-Club gathered at St Michael's Shanty for our annual Steak Roast. 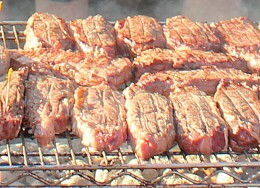 The coals were just right, and the steaks were fantastic. We would love to see you there next year. For info about joining the R-Club please contact Greg Mindala GMindala@thecrackteam.com. Children from all over the country travelled to attend one or more weeks of our Summer Camp this year. National Junior Summer Sports Tournament sponsored by the National F.O.C.A. was held JULY 10th - 16th, 2011. Children from 5th grade - 12th grade participated. 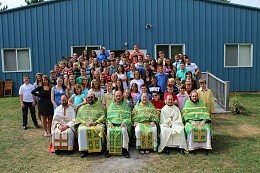 St. Vladimir's Session 1 (ages 11-16) was held July 17th - 23rd, and Session 2 ages (7-11) was held July 24th - 30th. Campers participated in arts, crafts, fun and games. Services were held in the chapel every evening and morning. 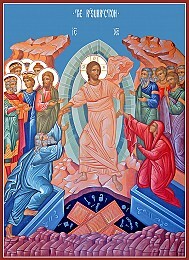 Divine Liturgies were celebrated on St. Vladimir's Day, Holy Prophet Elijah, and St. Panteleimon. Thank you to Dn. Daniel and Katrina Kovalak for their wonderful job as Camp Directors! On sunday, Bob and Liz Spiwak celebrated 50 years of marriage. 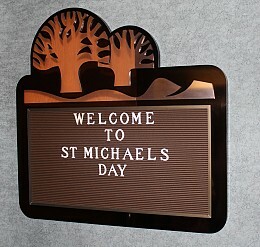 Being lifelong members of St Michaels, this was a joyous celebration not only for the Spiwaks, but for the entire parish family. Congratulations Bob and Liz! 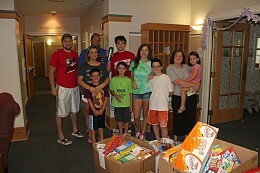 St Vladimir Summer Camp Directors, and St Michael's own - Dn Daniel and Catrina Kovalak led the collection of food and other items to be donated to Ronald McDonald House in Cleveland. Today, the donations were dropped off. 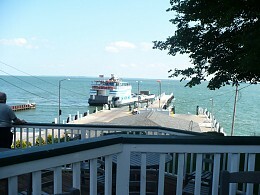 St Michael's 55+ Club made a day-trip to Ohio's Put-in-Bay, also called the Key West of the North. 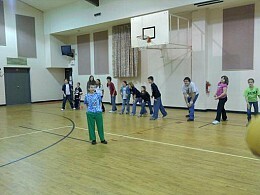 This weekend our parish's Jr. 'R' Club hosted a youth Lock-In. 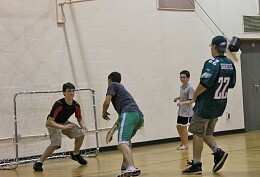 Youth from the Deanery parishes arrived on Friday night and enjoyed gym time, movies, crafts, video games and more. A lot of fun (and very little sleep) was had by all! Today the parish Friday Night Book Club, broke from their normal Friday night meeting time to go see The Help, a movie based on a book read earlier by the club. After the movie, they gathered at Champs for a delicious lunch and lively discussion. 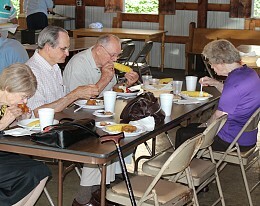 Today the 55+ club held their monthly meeting in conjunction with their Annual Picnic. Members and guests enjoyed fried chicken with all the fixings. 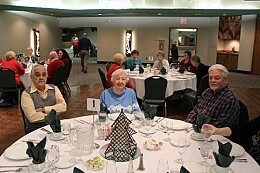 For information on joining the 55+ Club, please contact the church office (440) 526-5192. 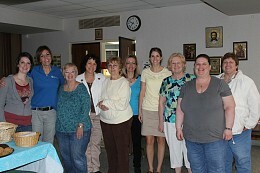 Our St. Lawrence Project is a group that meets regularly in order to benefit various charities. We have assembled care packages for IOCC and others. We hope that you join us next time for a fun filled evening. 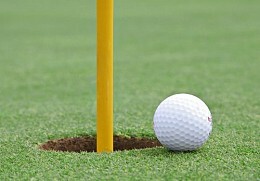 Members from our St Michael's took to the links at our annual Parish Golf Outing at Valleaire Golf Course in Hinkley, OH. After the round, the players enjoyed grilled hamburgers and hotdogs with all the fixings. Door prizes and awards for longest putt, closest to the pin, and longest drive were also given out. This weekend parishioners from St. Michael's and other local parishes gathered to attend a marriage enrichment seminar led by Dr Albert Rossi. Dr Rossi teaches courses in pastoral theology at Saint Vladimir’s Seminary, and is a member of the SCOBA Commission on Contemporary Social and Moral Issues. He has written numerous articles on psychology and religion. All of the couples present were edified and their marriages were strengthened. The 2nd Annual Fr. 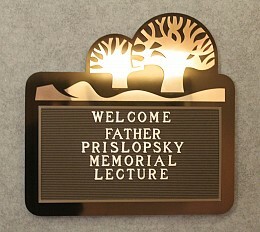 Prislopsky Memorial Lecture & Dinner was held at our Woodside Party Center. This year's guest speaker was the Very Rev. 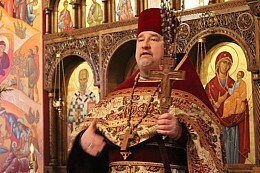 Daniel Kovalak, a son of St Michaels Parish. Fr Daniel gave a presentation entitled, "This Collar is Too Tight: And Other Pastoral Reflections", in which he spoke about his experiences of growing up at St Michaels under the spiritual leadership of Fr Vladimir Prislopsky. It was a wonderful presentation filled with nostalgia and memories from the past as well as inspiration and encouragement for the future. 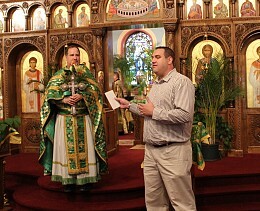 Archangel Michael Orthodox Church hosted the 2011 Ohio District FOCA Convention. 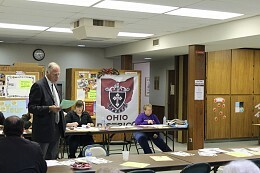 Members from all over Ohio attended the meeting. Afterwards, Vespers was attended and the new elected officers were sworn in. 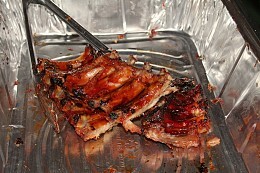 Tonight almost 200 people attended a pig roast sponsored by the Cleveland 'R' Club, Chapter 4/6. All proceeds went to benefit the renovation efforts of St. Vladimir Camp Chapel. Today, after Liturgy, instead of our normal coffee hour fare, St Michael's Sunday Scool program sponsored the annual Sundae Sunday. 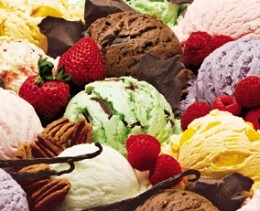 Parishioners got to make their own custom-made ice cream sundaes. The money collected will be donated for the purchase of a motorcycle for Orthodox priests in Kenya. On Sunday after Liturgy, the Cleveland 'R' Club hosted its 2nd Annual Cleveland Browns Tailgate Party. Parishioners and their friends gathered at the Shanty for All-You-Can-Eat wings, burgers, hotdogs. Many of our parishioners gathered today to help make pierogi to be sold at our upcoming Craft Show. 270 dozen pierogis were made! 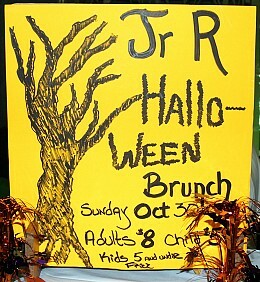 St Michael's Jr. 'R' Club hosted its Annual Halloween Brunch after Liturgy on Sunday. Members of the Jr. 'R' Club got decked out in their Halloween costumes and served parishioners a fantastic brunch. In keeping with the Halloween season, tonight's bingo volunteer workers came in full costume. Today after Liturgy we held our annual St. Michael's Day Banquet, which is always held the Sunday before St Michael's Feast Day. Today on the feast day of our parish, several area clergy and many parishioners attended the Divine Liturgy at our parish. After liturgy a luncheon was held in the church basement. Today members of St Michael's 55+ Club gathered for the annual Panikhida service to pray for the departed members of the club. 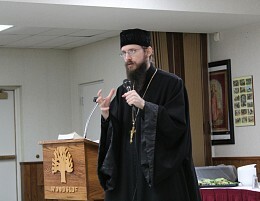 Today Igumen Sergius, the abbot of St. Tikhon's Monastery led an Advent Retreat here at St. Michael's. Over 50 people from ours and local churches gathered to hear Fr. Sergius talk about why God became man. Fr Sergius also brought a miracle-working icon of St. Anna and the relics and Stole of St. Seraphim of Sarov. Liturgy for the Feast of St. Herman of Alaska. 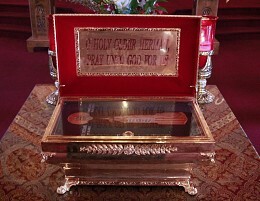 Our parish is blessed to have the relics of St Herman. Today, parish youth and their parents visited 5 area nursing homes to sing Christmas Carols and spread holiday cheer to the residents. Today, members of the St Michael's 55+ Club gathered together at St. Michael's Woodside Party Center for their Annual Christmas Social. 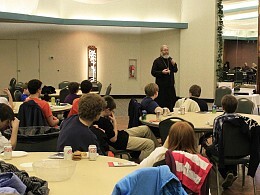 On Dec. 30, youth from around the Cleveland Deanery gathered for a Lock-in hosted by St Michael's at Woodside Party Center. Overnight, the kids played basketball and kickball, watched movies on the big screen, ate pizza. 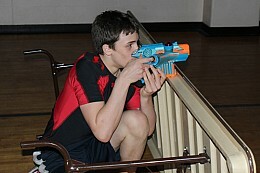 However, the most fun was had playing laser tag! On Martin Luther King Day, Orthodox youth gathered from around the Cleveland Deanery at St. Michael's Woodside for our 2nd Annual Deanery Youth Day. We began the day by watching the movie, Facing the Giants - which is filled with Biblical principles and lessons. Afterwards we ate pizza and played dodge-ball in the gym. Also attending this year's Youth Day was Bishop Matthias. His Grace spent the whole day with the youth and hosted a question and answer session. He was even spotted shooting hoops! It was a great turn out and a fun-filled day.